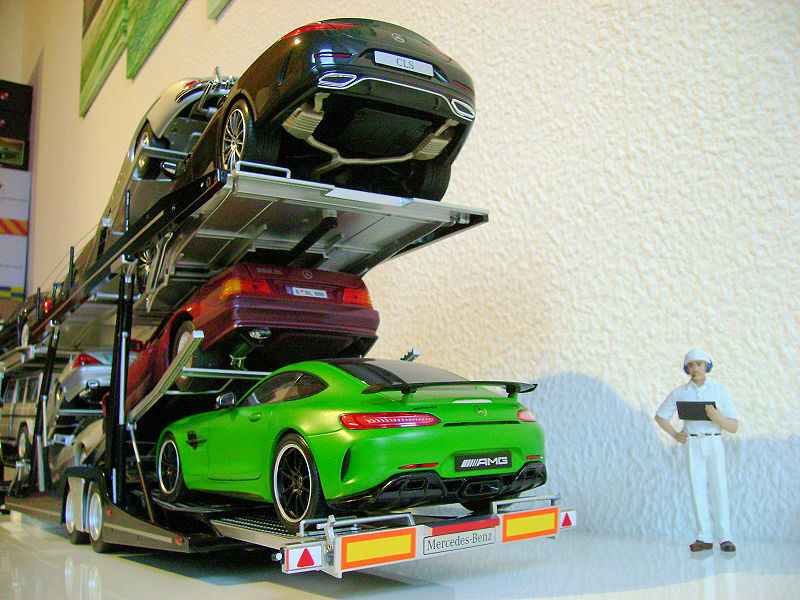 This car carrier is a familiar sight on European roads, carrying what will become their new pride and joy for up to 9 prospective owners. The Mercedes Dealer Edition does not bear any branding, but it can easily be identified as Lohr’s Eurolohr 200 series by the trailer’s two axles. The developing engineer at NZG confirmed to me in our phone call that, more precisely, the carrier is modelled on the Eurolohr 253. He further told me that NZG’s own trailers will have the branding while Mercedes wanted it deleted for their dealership edition. 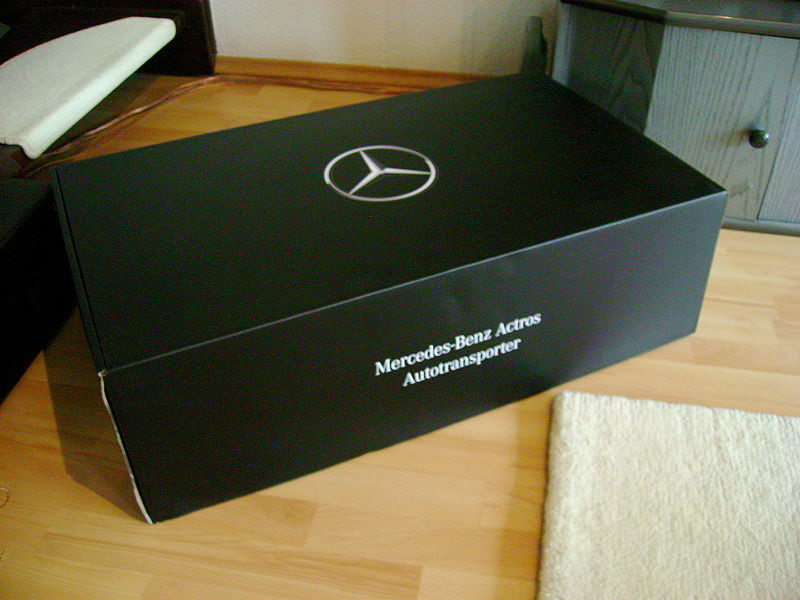 On the other hand, only Mercedes sells a trailer and tractor package. And what a package it is! 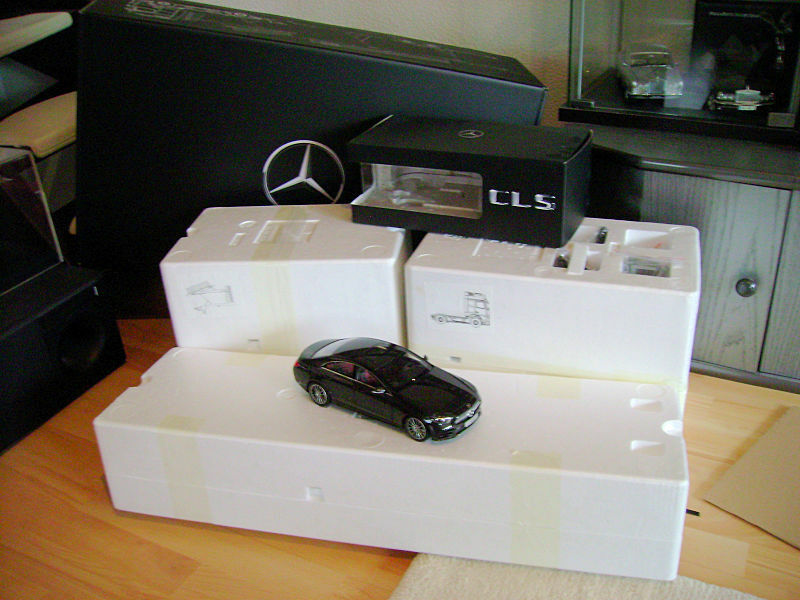 It dwarfs the usual Mercedes dealership 1:18 model car box so that I decided to add pictures of the rather extraordinary unboxing-process. 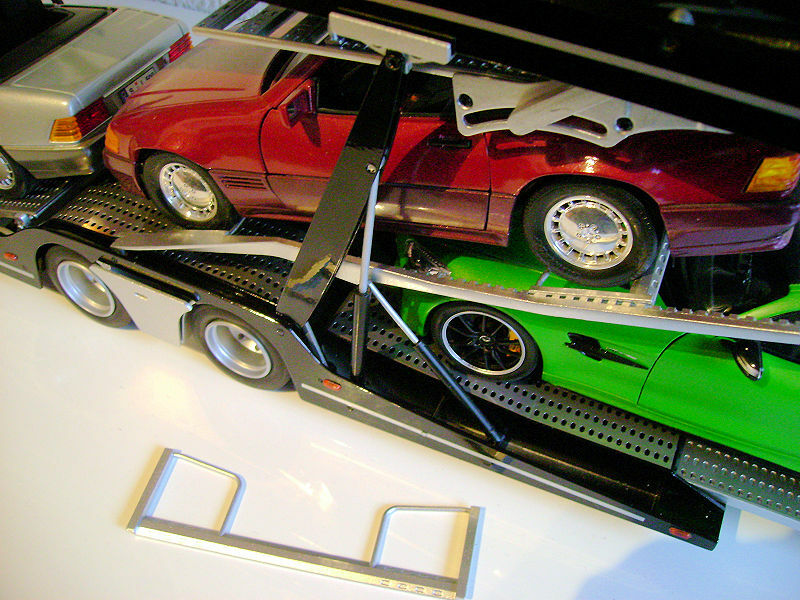 We all know how to unbox the normal 1:18 model as something that takes only a couple of minutes before the model is ready to join its companions in our display case. 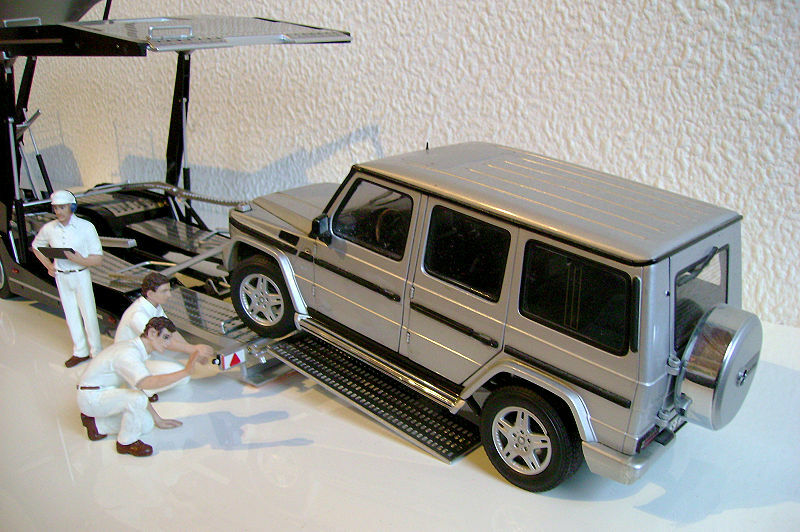 A word of warning: Do reserve some time and patience for what Mercedes advertises as “a giant in a small form”. It’s not a small form at all, it’s a behemoth that will be up to 120 cm (47 inches) long with its rear ramps down, but at least 104 cm (41 inches) in its most “compact” on-the-road-setting and weigh 20 pounds – without automotive cargo! The tractor alone weighs 10 pounds and to remove it from one of the three styrofoam-shells you not only lift off the lid but partially remove to cut-out parts on its sides to get a grip of the tractor. The manual explicitly warns you about its weight and the fact that most of it being towards the front meaning the model will be out of balance from where you grip it. 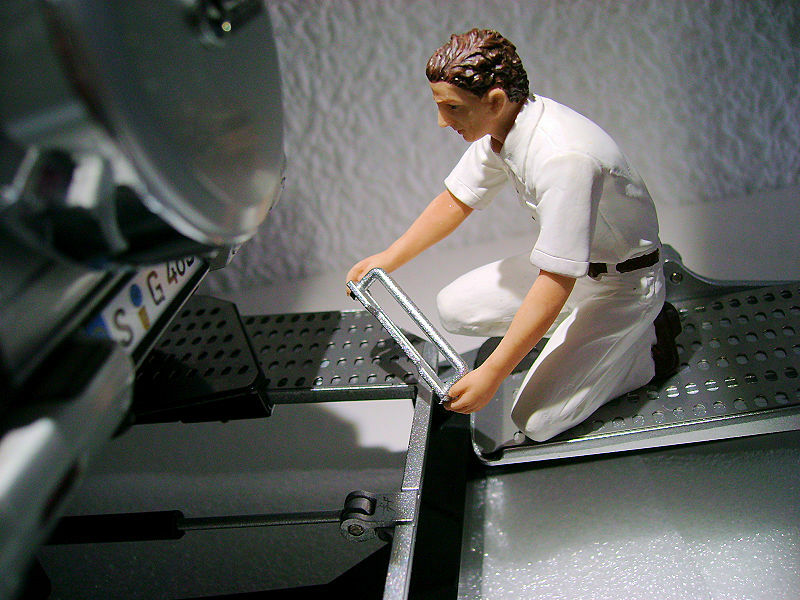 You don´t want it to tip over and uncontrollably drop out of your hands. The tractor itself does not need much further review after my last year’s review of the Actros Gigaspace. 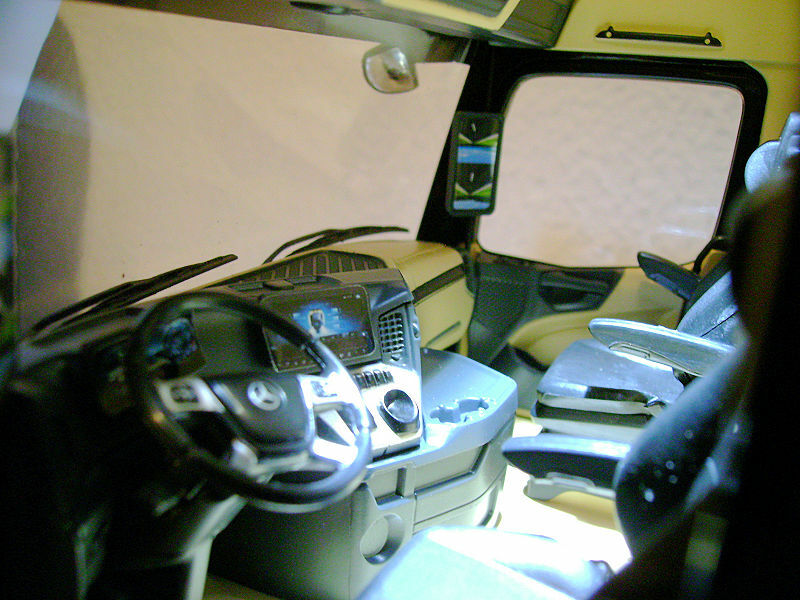 The most significant change are the MirrorCams: Instead of the door mirrors two aerodynamically flat rearward cameras are fixed to the cabin right over the doors and the driver has two screens in the old mirrors’ shape and size on the A-pillars inside the cabin. Other than that, you have slightly re-designed rear lights and the 1863 badge on the door informs us that this tractor has the range’s biggest 15.6 litres 635 horsepower engine. However, if you are the proud owner of the “old” NZG Actros 1851, you can, of course, buy the Eurolohr semi-trailer separately and couple it to that. 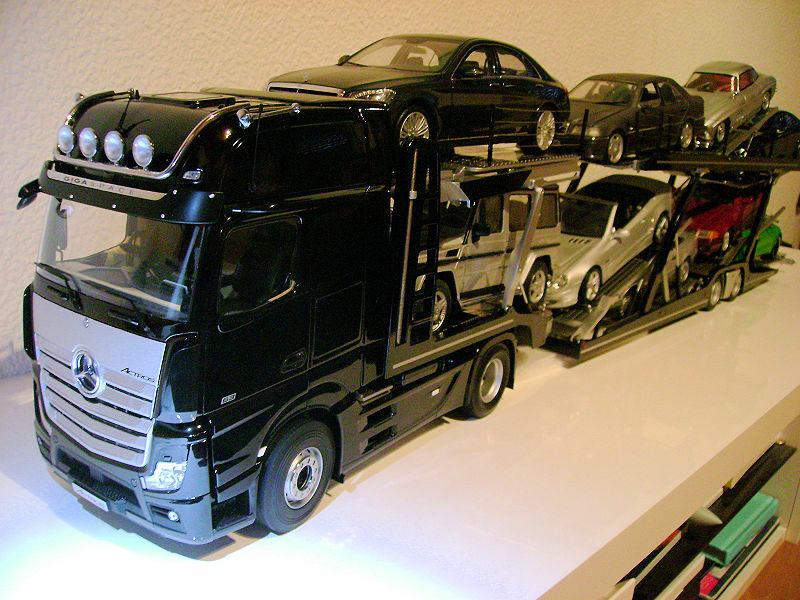 Especially the black Actros with the silver Mercedes star painted onto the cabin’s sides this will look great with the black and silver semi-trailer. 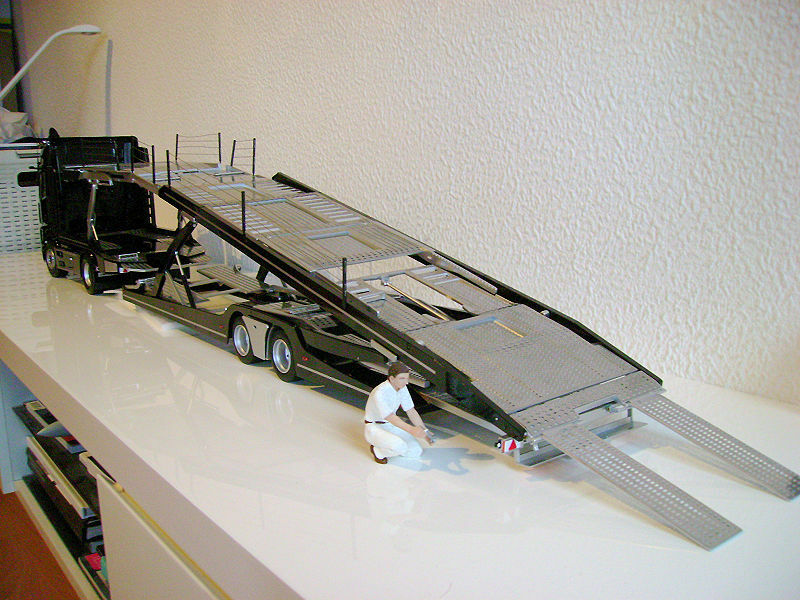 Why this is not recommended, though, if you occasionally want to change trailers (NZG offers containers and container trailers, too, and who knows what else might be coming), becomes clear, when we open the next Styrofoam shell and turn our attention to the Eurolohr semi-trailer. 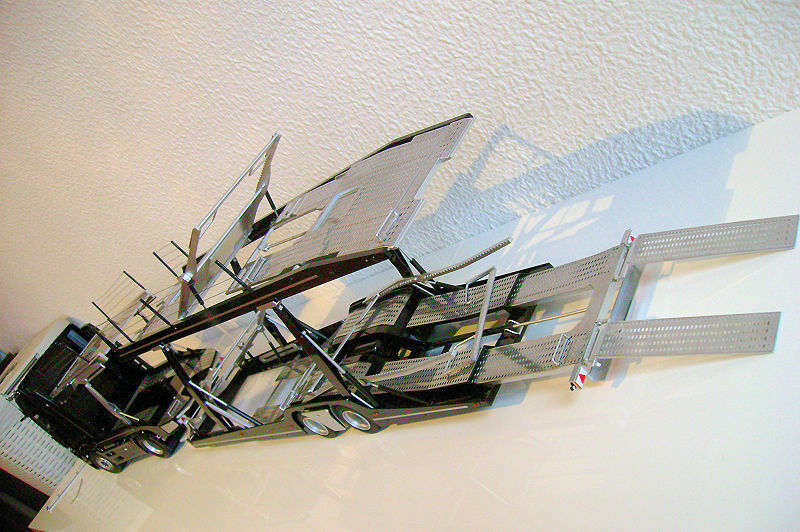 The original Eurolohr semi-trailer tractor chassis can be removed in minutes with the rest of the trailer so that the tractor can pull other loads. 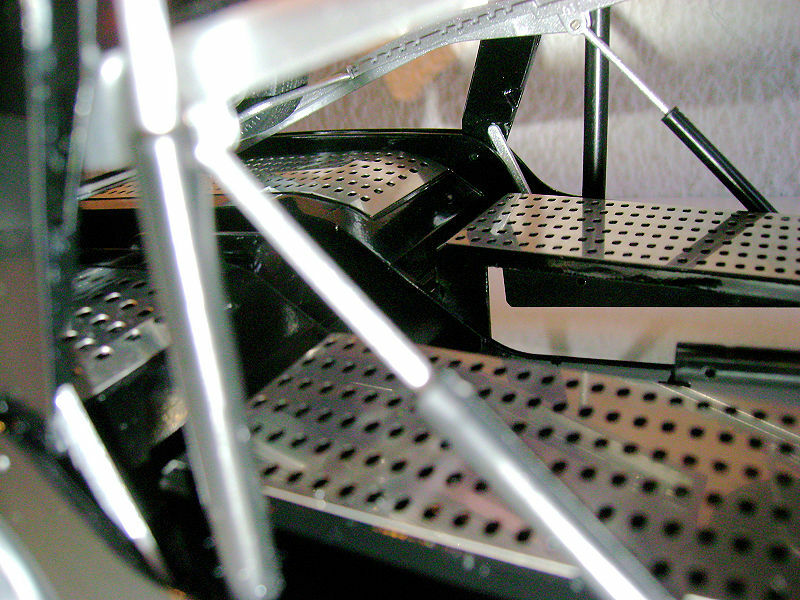 When you install the model tractor chassis, you realize, that you will neither be able nor willing to do that as easily and quickly as the original. 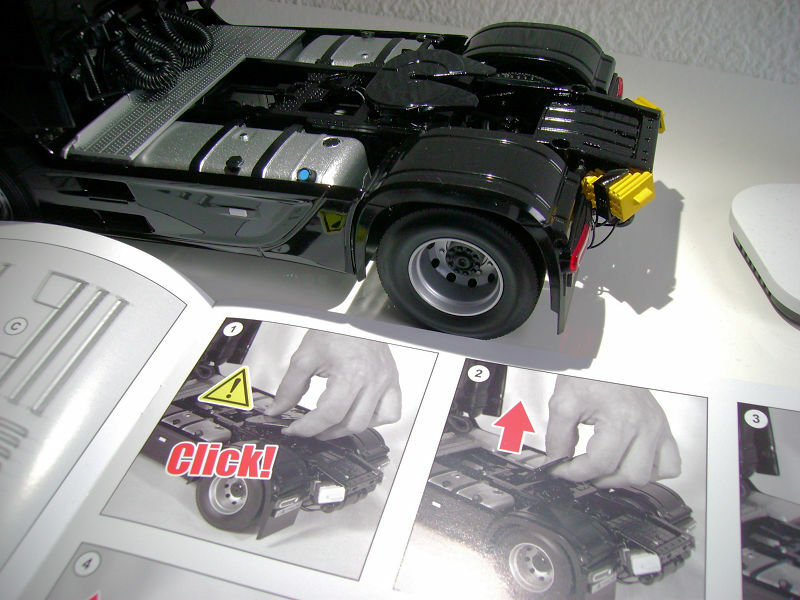 You first have to remove the fifth-wheel coupling from the tractor and use one of its two parts with the mounting set that comes with the semi-trailer to mount the chassis to the tractor by means of plastic parts and 6 metal screws. Right behind the cabin a mounting point needs to be added by fixing a plate on top to a plastic bracket underneath by 4 screws. NZG admitted that driving metal screws firmly into a plastic bracket constitutes a weak point in a mostly metal 20-pound model, but it has been favoured over a metal solution in the development process because they wanted to avoid scratches on the tractor’s paint. The rest of the trailer… does not come pre-installed either. 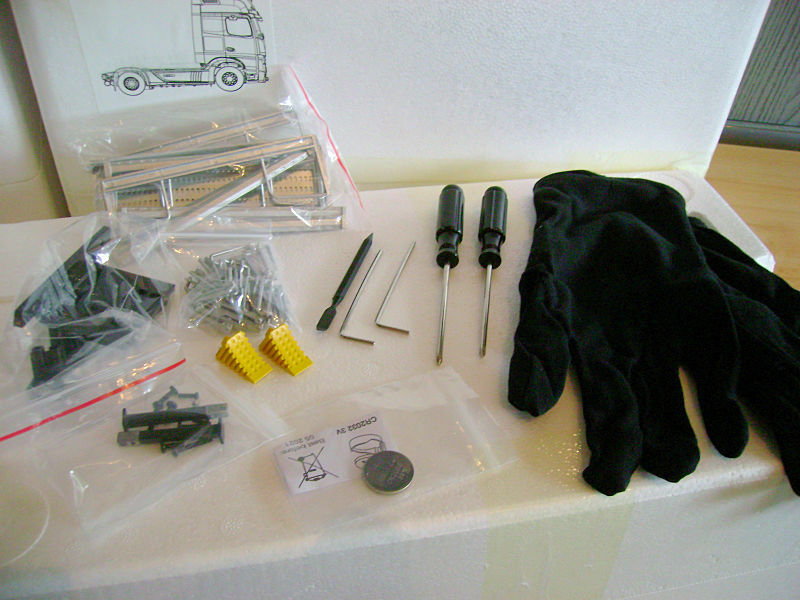 Before you can install all the small parts, you need to familiarize yourself with how the trailer changes shape, what can be moved and how… and what cannot. 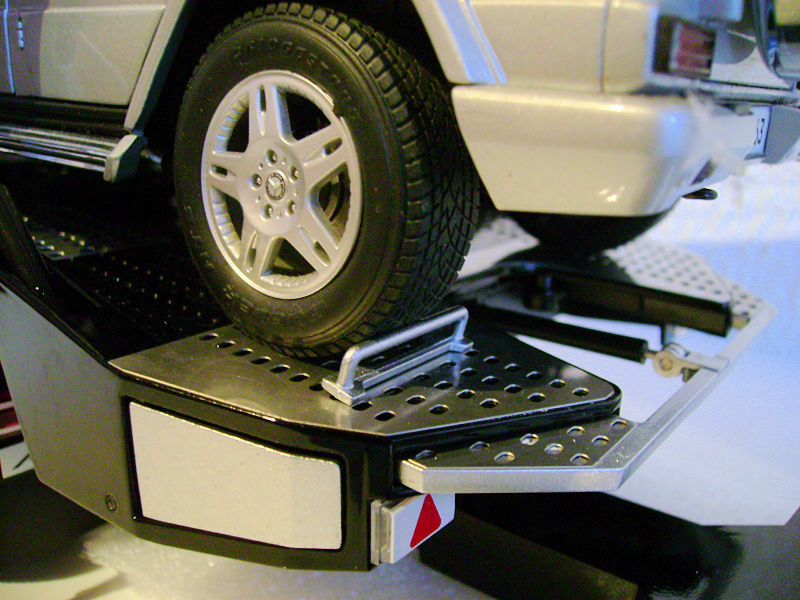 This is not a simple two-deck open car trailer. 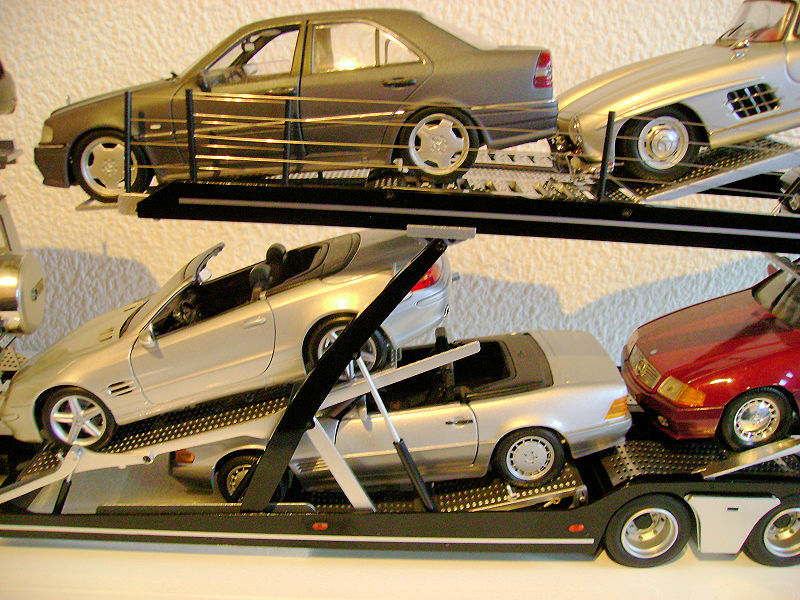 Like the original Eurolohr, this can be moved to accommodate a maximum of 9 cars of different shapes and sizes, tilting them at dangerously adventurous angles. 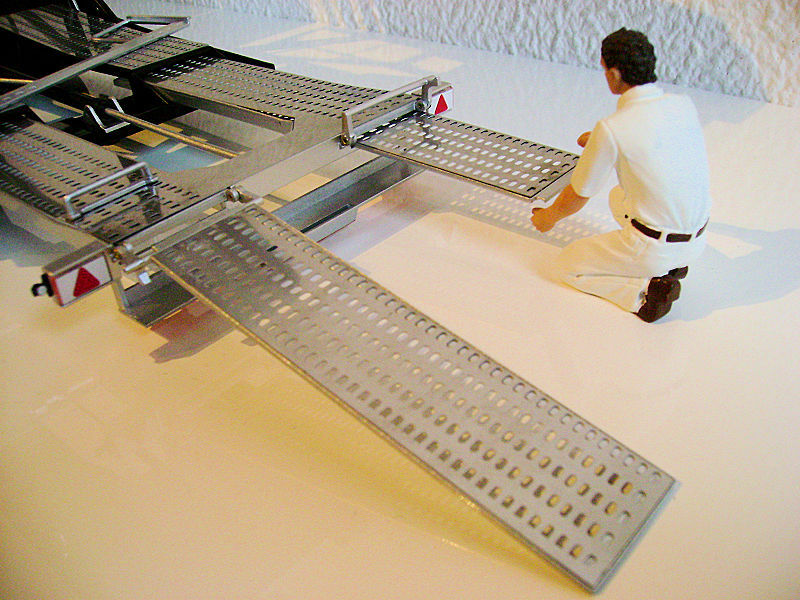 And there is a real danger here: whereas the real operator only needs to ensure that he does not crash or crush his load while rolling on/off and adjusting the trailer hydraulically (NZG has replicated the controls for that in the right-hand-side silver box between the wheels), the collector will need to ensure that the positions are sufficiently stable and won’t collapse onto the valuable cargo. 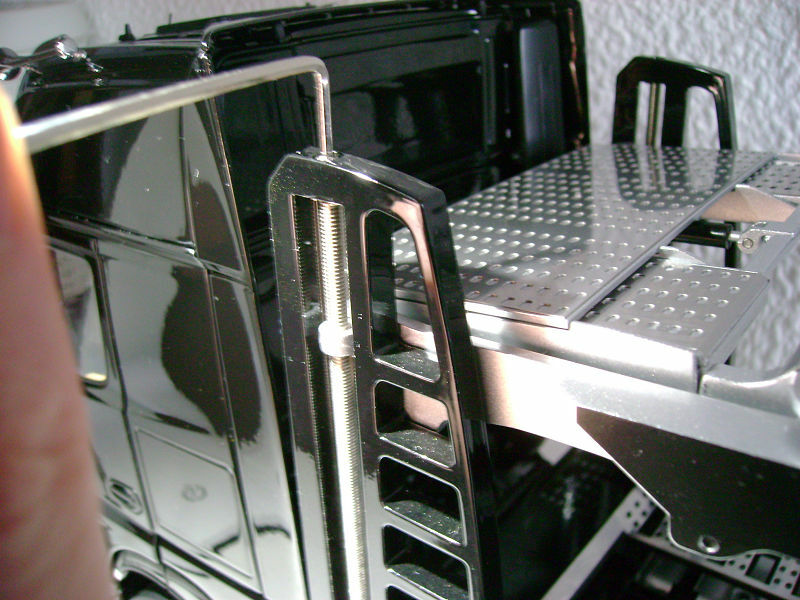 This again will have to be done by setting minute metal bolts into holes in the sliding-rails of the front pillars, locking silver levers into the rear pillars, loosening and tightening screws, operating Allen wrenches, sliding and extending or collapsing the decks, re-positioning the accessory bars, brackets and positioning clamps. Some of the joints are held by metal pins only, one of which rolled from the box towards me before I even touched the trailer. Luckily, NZG will send me a replacement, but it warns you to be careful with the delicacy that comes with the full functionality the original offers. 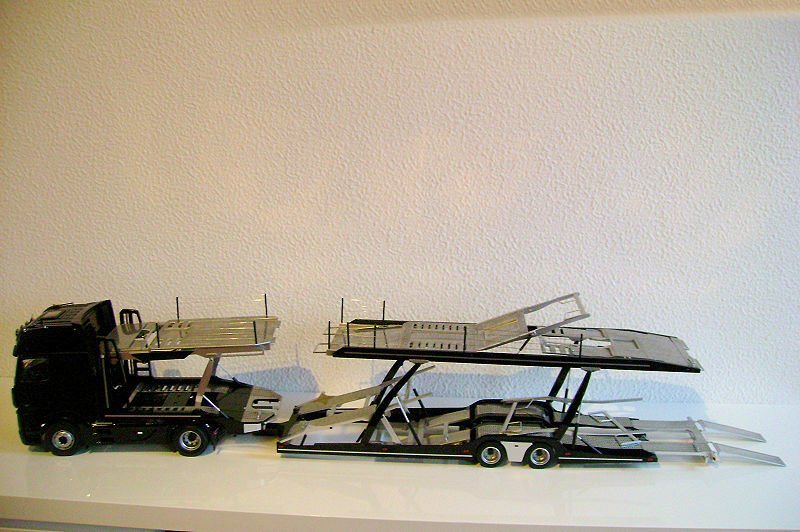 So, in contrast to Norev’s Bartoletti this Eurolohr semi-trailer car carrier is a brilliant model in its own right, almost too good to be used as a mere stage to display car models, more like CMC’s race transporters. Small wonder, these sell like hotcakes despite a massive 630€ price tag. 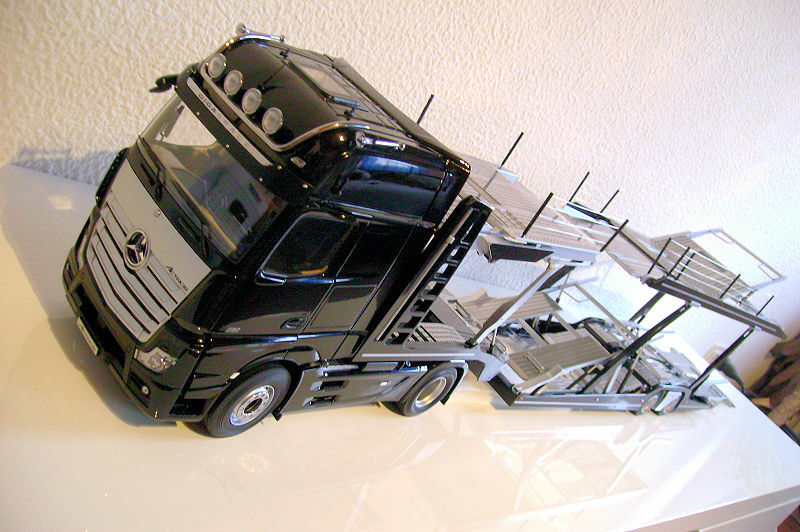 At least for collectors with a Mercedes theme in their collection, this is a must-have, either with this Actros tractor or the one with the Mercedes Star artwork on the cabin. I would like to extend my thanks to NZG’s developing engineer for his patience and support, offering his advice and sending me spare parts to fix some of the faulty points. It’s great customer support, that a model’s creator takes the time to talk to a customer and personally sends out spares to fix issues. 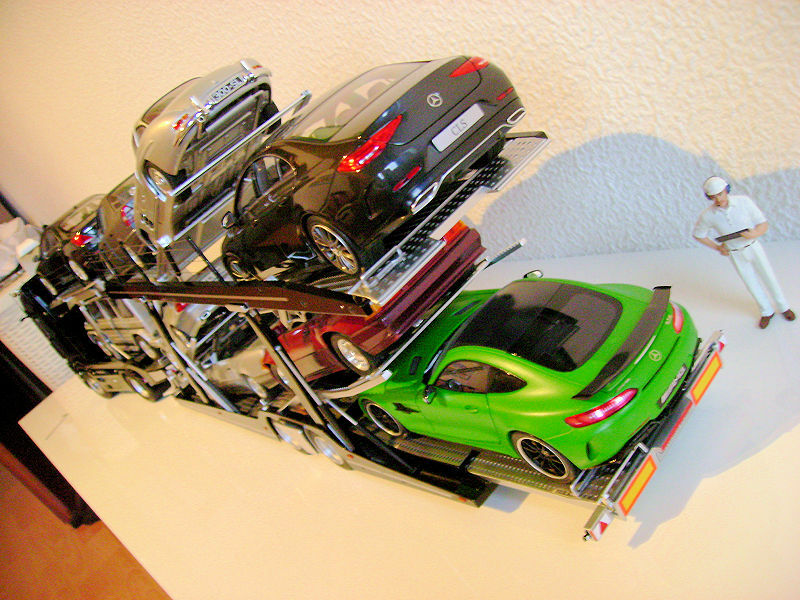 8 Responses to "REVIEW: NZG MB Actros Gigaspace & Eurolohr Car Carrier"
Wow, what a monster. 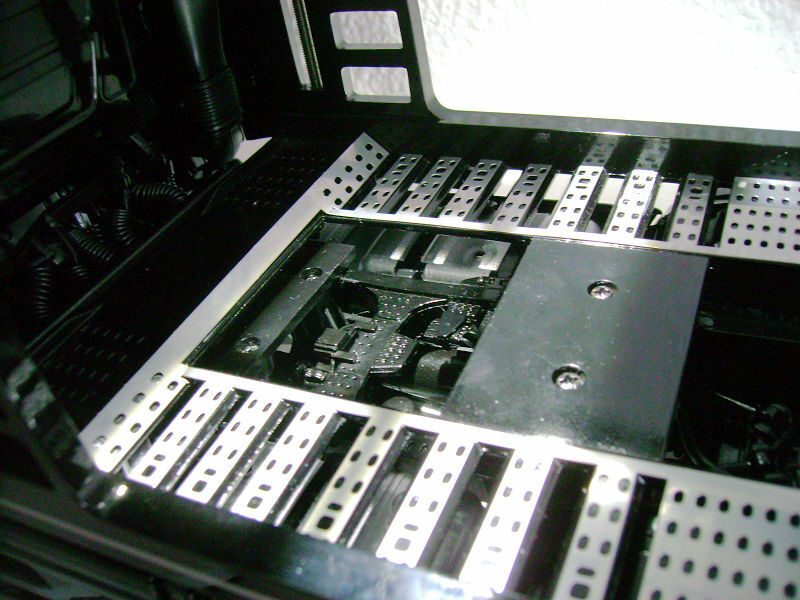 And it looks so well built. 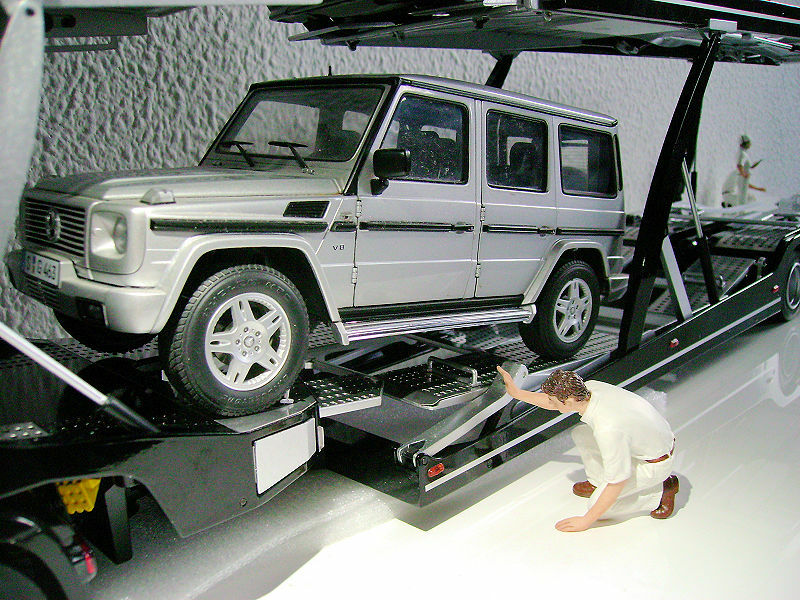 The price is high but you get a lot of model here, and one that is rarely executed in scale. Thanks for sharing! Thanks for the really informative review. This is an incredible piece of kit and I’ve been eyeing them and waiting to pull the trigger. Since I already have the truck I’ll, be looking for the Lohr badged units. 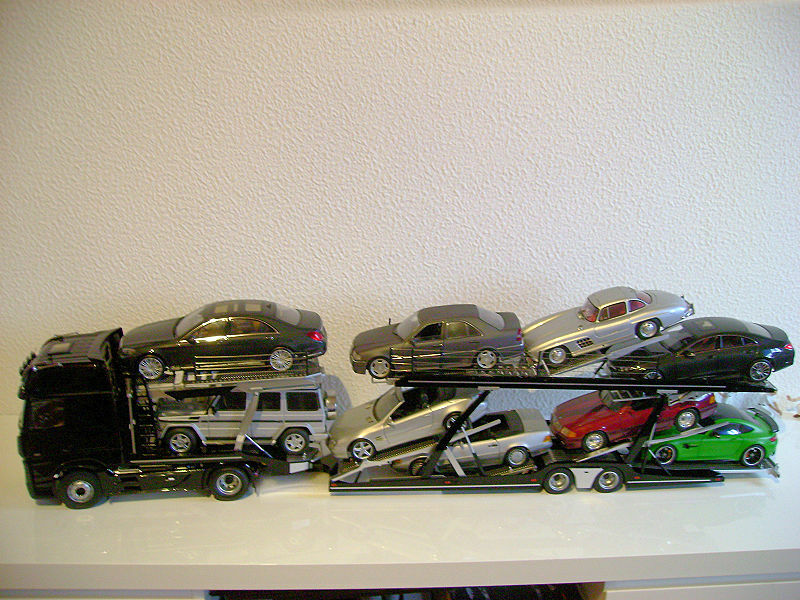 And most importantly, planning what cars to load! My pleasure, Roberto. Be aware, though, that the trailer will be at least 50 Euros more. If that seems to be worth it to you, go for it. I would look around for options to pre-order it. 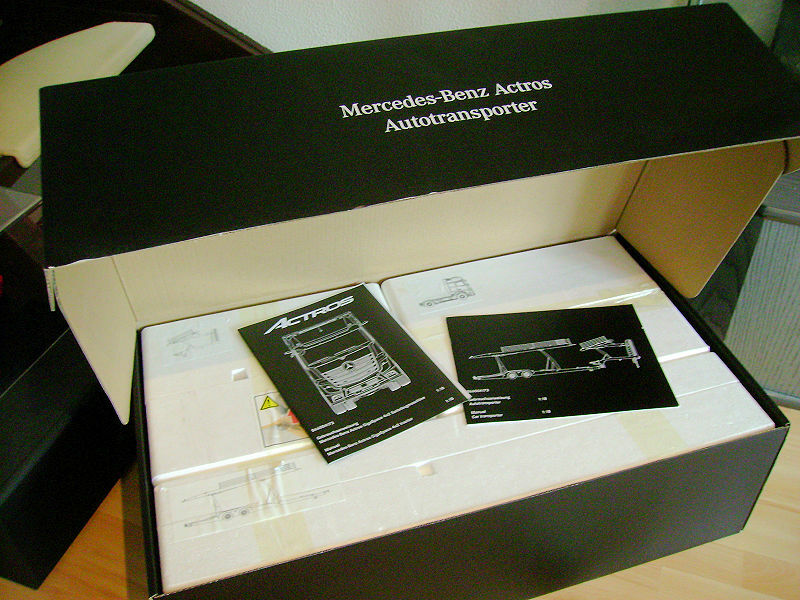 Thank you DS Team, please let me know the Mercedes part Numbers of the kit, would you? the trailer only is B66004174. 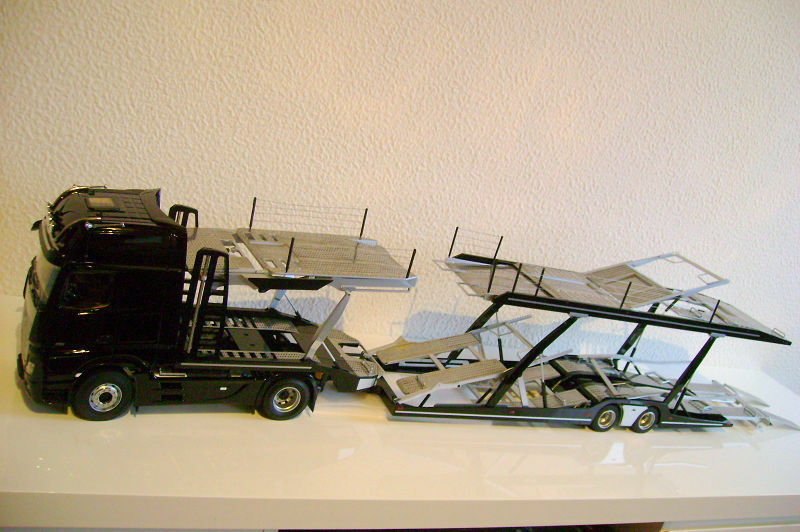 Another question: dosel the tractor and trailer come together in one single box, or each one in a separate box? 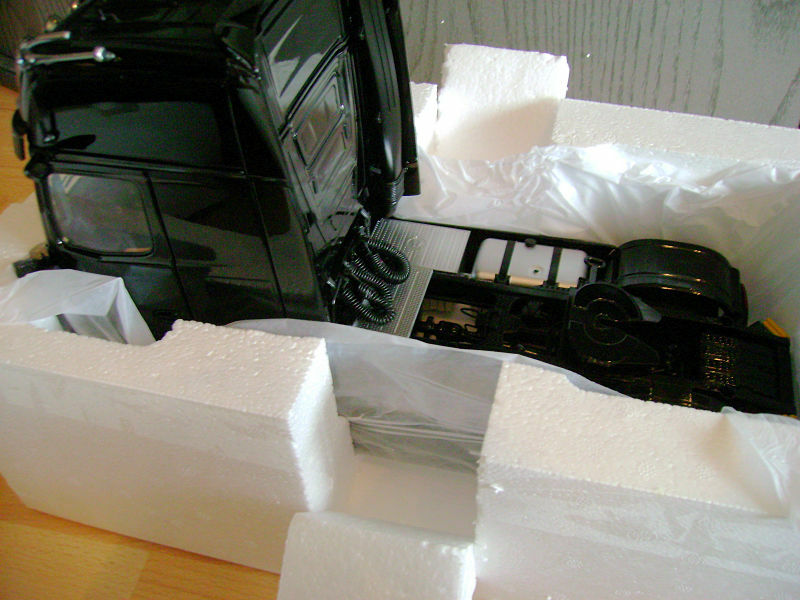 One huge black box, as shown in the pictures, containing three styrofoam shells.